Home » Steel Pick Up Truck Loading Ramps For Sale Factory Direct Guarantees Lowest Price! ← Loading Platform Forklift Attachment For Sale Factory Direct Lowest Price Guaranteed! 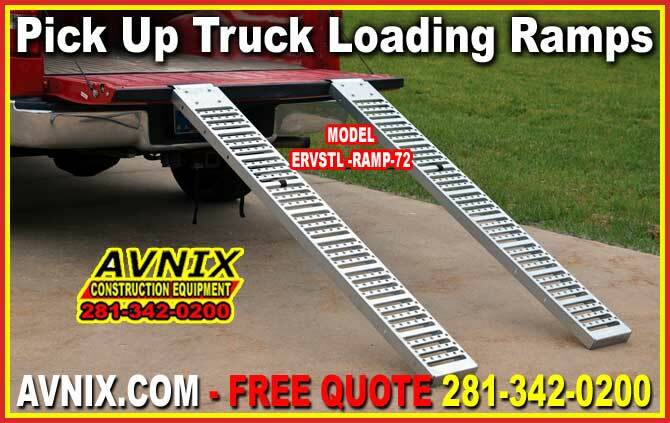 There are many different pick up truck ramp options for sale on the market today which can be very confusing for landscaper lawn mowers, Motorcycle and ATV riders. The wide variety of these loading ramps permit users to find the right loading ramp that will enable each of them to load and haul safely according to their different circumstances and setups. Now, before an loading ramp can be selected it is the user power to think about what they are really looking to do with the ramp. These economical serrated pick-up truck loading ramps provide minimum slippage. Overlapping lip provides smooth transition into cargo area. Single piece construction with bolt-on lip. ERVSTL-RAMP-72 72″ 9″ 1,000 lbs. 500 lbs. 43/pr. ERVSTL-RAMP-96 96″ 9″ 1,000 lbs. 500 lbs. 60/pr.